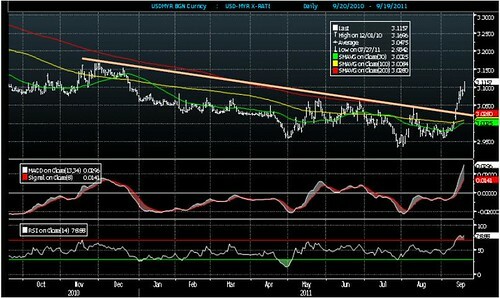 Since May, the dollar index (DXY) was consolidated within the range of 72-76 until recent breakout above the downtrend line resistance in early September to as high as 77.78 before closing at 77.09 yesterday, as the US$ rose against all its major counterparts amid falling stock prices, spurring demand for safer assets amid worsening Europe sovereign debt crisis. Based on weekly chart, DXY medium to long term outlook remain bullish to retest the 81-83 resistance zones although it may face some short term profit taking consolidation near the daily 50-d SMA. Correspondingly, the strong DXY and persistent foreign selling had weakened the Ringgit by 6% from RM2.937/US$ on 27 July to close at RM3.114 yesterday. 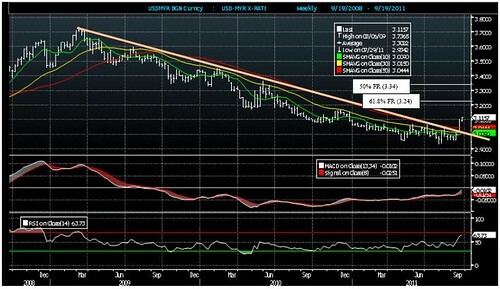 Based on the bullish weekly chart, Ringgit could depreciate further towards RM3.24-3.34/US$ in the medium to long term. However, as daily chart is indicating possible profit taking consolidations amid spiking MACD and RSI is approaching 80, Ringgit is likely to find some near term support at RM3.00-3.03.